About one-third of Mexico’s land area is covered by biodiversity-rich native forests, two-thirds of which are considered to have commercial potential. Despite the biological riches and commercial potential, almost 55% of forest-dependent communities are extremely poor. Particular to Mexico, some 80% of forests are owned by indigenous and other communities, giving forest land ownership a strong social nature. Yet Mexico’s forest resources are far from meeting their potential for alleviating poverty and contributing to local development and the national economy. While the Government of Mexico is extremely concerned about conserving the nation’s forest resources and using them sustainably, the forest sector policies and programs do not fully reflect the unique tenure structure of the forests. Meanwhile, in the last 25 years, numerous Mexican forest communities have managed to develop reasonably successful, commercial community forestry enterprises based on timber and non-timber products. Some of these are among the world’s most advanced examples of commercial community forestry. The large majority of forest communities, however, run less-advanced forest businesses. While much analysis has been done in the last few years on the economics of community forestry in Mexico and its potential to be competitive, most of this work has been done in isolation from critical stakeholders and has fallen short of generating coherent dialogue and the consensus required to reorient public policy in support of CFEs. In order to help inform Mexico’s forestry priorities, internal policies, and programs in support of community forestry competitiveness, this activity aimed to develop consensus (through a stakeholder-driven process) on the key constraints and policy actions required to position Mexico’s community forestry sector as a high-value provider to niche markets from sustainably managed community forests, delivering both income and biodiversity protection. characterize the current policy and incentive framework of the community forestry sector. Next the activity would conduct the in-depth analysis needed to develop specific policy, incentive, and public expenditure recommendations to the Government of Mexico and the National Forestry Commission (CONAFOR) to enhance the competitiveness of community forestry. Guidelines for financial and economic evaluations for community forestry (Spanish and English versions). Training material for financial and economic evaluations for community forestry (Spanish). Capacity building services to CONAFOR and private and public stakeholders provided to date are: (i) Stakeholder workshop (Nov. 2010); (ii) Stakeholder workshop (July 2011). Data collection training (Mar 2012). 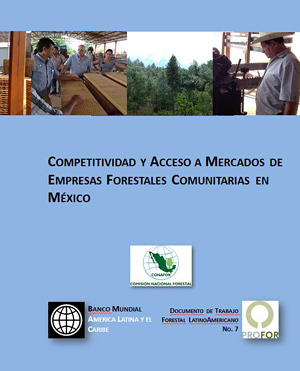 Financial analysis of 30 selected representative community forest enterprises -- now available in Spanish. The survey touched on topics such as: land equivalent values, profitability of CFEs, forest management, harvesting, sawmills, economic incentives, payments for environmental services, etc.